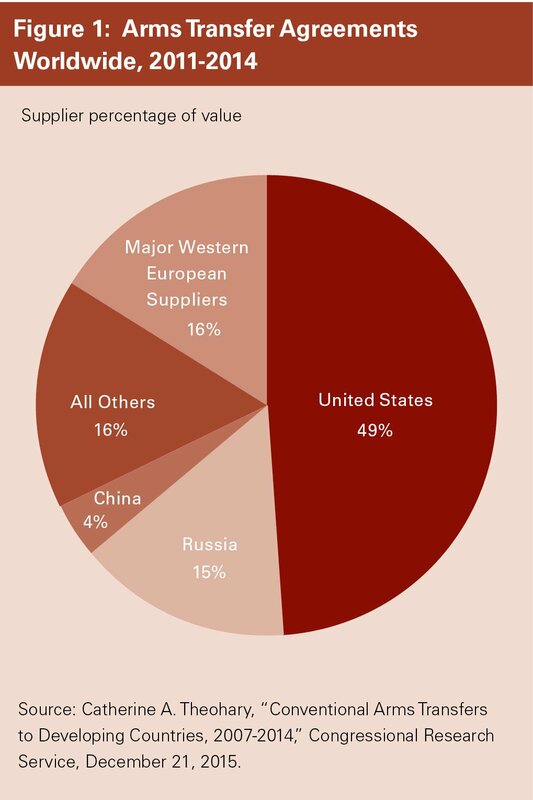 The United States remains the world’s largest supplier of major conventional weapons systems, increasing the value of arms agreements it has concluded in the past years, according to a recent report by the Congressional Research Service (CRS). Russia maintains its position as the second-largest arms merchant, with China and four European countries also among top suppliers to an arms market primarily comprised of developing countries, the report says. The United States concluded $36.2 billion in arms transfer agreements worldwide in 2014, the most recent year detailed in the report. That total was up nearly $10 billion from the 2013 total and constituted just more than half of all global 2014 agreements, which were valued at $71.8 billion, slighly above the 2013 total of $70.2 billion. Nearly $30 billion of U.S. agreements in 2014 were with developing countries, including large-value pacts with Iraq, Qatar, Saudi Arabia, and South Korea. Three of those four countries are in what CRS report author Catherine Theohary terms the Near East, a region that accounted for more than 60 percent of all developing-country agreements from 2011 to 2014. Led by Saudi Arabia, the developing world’s top arms purchaser, the oil-rich Gulf Cooperation Council (GCC) countries have received advanced air, naval, and missile defense systems and historically have been driven by “concerns over the growing strategic threat from Iran,” according to Theohary. In 2014, agreements were reached to supply anti-tank missiles, Patriot Advanced Capability-3 missiles, Javelin missiles, AH-64D Apache helicopters, and other weapons to GCC countries. In the time period beyond the one covered in the report, the Iran nuclear agreement was concluded, and oil prices slid significantly. Those developments, however, have not stopped arms transfer agreements to the Middle East, which is increasingly racked by conflict. In 2015 and 2016, the Obama administration has notified Congress of a number of potential major arms transfers to GCC countries. Those to Saudi Arabia, by the United States and others, are drawing particular scrutiny in light of reported use against civilians and other abuses by the Saudi-led intervention in Yemen. In reviewing a November 2015 notification of a potential $1.3 billion sale of advanced air-to-ground weapons to Riyadh, Senate Foreign Relations Committee Chairman Bob Corker (R-Tenn.) and ranking member Ben Cardin (D-Md.) invoked a new authority that requires the State Department to notify Congress at least 30 days prior to the delivery of an arms shipment. Such pre-delivery notifications, which were written into the Arms Export Control Act in December 2014 with the Middle East in mind, have not been invoked previously. They require a joint request of the chair and ranking members of the Senate Foreign Relations Committee or House Foreign Affairs Committee. Congress can pass legislation to block or amend arms agreements up until delivery but, in the absence of a delivery notification, typically has restricted its review to the agreement stage. More recently, a Feb. 14 Human Rights Watch report said that Saudi-led coalition forces have used advanced, U.S.-provided sensor-fuzed cluster munitions in civilian areas in Yemen, contrary to U.S. restrictions. Also, the European Parliament adopted a nonbinding resolution on Feb. 25 finding that arms transfers to Saudi Arabia violate EU rules and initiating work toward an arms embargo on the country. An official embargo would be established by a separate European mechanism, making the timing and prospects of such a move uncertain. A report last month with arms transfer information updated through 2015 by the Stockholm International Peace Research Institute (SIPRI) commented that the intervention in Yemen was facilitated by “high levels of arms imports,” with Saudi Arabia’s imports increasing by 275 percent for the period 2011-2015 as compared to the previous five years. Even with concerns over Saudi attacks in Yemen, the report authors said it is expected that Saudi Arabia would “continue to receive large numbers of major arms,” including 150 combat aircraft and thousands of missiles from the United States. Still, Russia remains a primary supplier to India, the developing world’s second-largest arms purchaser over the report’s eight-year period (2007-2014). Increased competition for India’s arms purchases, as evidenced by the selection of France to supply next-generation combat fighter aircraft, indicates that Russia cannot rely on India as an arms purchaser for the long term, the CRS report says. Led by India, the Asian region itself is the second-largest developing-world arms market, accounting for nearly 30 percent of the developing world’s arms agreements from 2011 to 2014 ($72.4 billion). In recent years, the United States has replaced Russia as the top arms supplier to the region, concluding, for example, more than $7 billion in arms agreements with South Korea in 2014 alone. China, although listed as a developing country, is also one of the world’s top suppliers, accounting for $13 billion in agreements with other developing countries from 2011 to 2014, which is fifth overall. Primarily seen as a seller of small arms and light weapons, especially to Africa, China is increasingly marketing advanced aircraft. European countries, in particular France, Germany, Italy, and the United Kingdom, also remain important arms suppliers but with significant annual fluctuations in agreements. Those four countries accounted for just under 10 percent of agreements with developing states in 2014, down from more than 25 percent in 2013, according to Theohary. The recent SIPRI report adds Spain to the list of top European exporters and notes that the five countries together accounted for 21 percent of all arms transfers between 2011 and 2015. SIPRI’s report focused primarily on actual transfers, whereas the CRS report has sections on agreements and deliveries.